Belgrade, Serbia - The Holy Archbishop of Pec, Metropolitan of Belgrade-Karlovci and Patriarch Irinej of Serbia, was enthroned today, Saturday January 23, 2010, following the Holy Hierarchical Divine Liturgy at the Cathedral church in Belgrade. The liturgy was served by His Holiness Patriarch Irinej of Serbia with the concelebration of his brother Bishops, priests and deacons, and also representatives of the Russian and Greek Church. The Holy Liturgy was attended by Apostolic Nuncio to Serbia Mr. Orlando Antonini, Roman Catholic Archbishop of Belgrade Stanislav Hocevar, Reis-ul-ulema of the Islamic Community of Serbia Adem ef. Zilkic; Serbian Mufti Muhamed ef. Jusufspahic, representatives of churches and religious communities in Serbia; Ms. Slavica Djukic-Dejanovic, Speaker of the Assembly of the Republic of Serbia; Mr. Mirko Cvetkovic, Prime Minister of the Government of theRepublic of Serbia; Mr. Milorad Dodik, Prime Minister of the Government of the Republic of Srpska; Crown Prince Alexander Karadjordjevic with his wife; prof. Dr. Bogoljub Sijakovic, Minister of Faith in the Serbian Government; Mr. Ivica Dacic, Minister of Internal Affairs in the Serbian Government; Mr. Dragan Djilas, mayor of Belgrade; Mr. Mladjan Djordjevic, assistant to the President of the Republic of Serbia; Mr. Dragan Curovic, state secretary at the Ministry of Faith in the Government of Serbia. 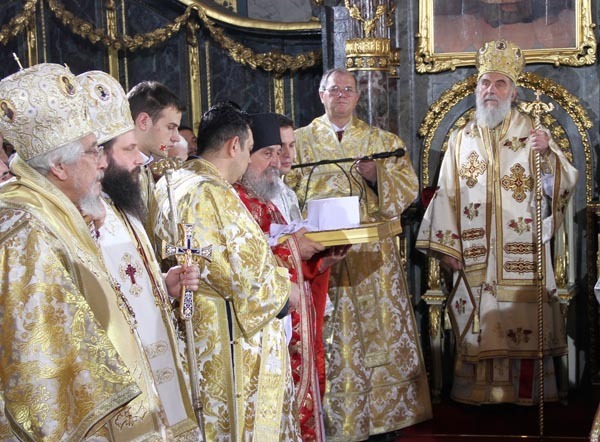 In the course of handing over the patriarchal insignia to Patriarch Irinej of Serbia, Metropolitan Amfilohije of Montenegro and the Littoral recalled the life, deeds and sacrifices of the previous Serbian Patriarchs. Metropolitan Amfilohije wished His Holiness that he be a worthy successor to St. Sava and all the other Saints, the worthy and honorable predecessors. His Holiness Patriarch Irinej of Serbia, in an first homily as patriarch, pointed out that today was a great day not only for for him personally but also for our Church and our people, because the Patriarch of Serbia has always represented before God and in history the fullness of the people, sharing its fate, tragedies, but also its joy. His Holiness said that his heart is fluttering like a leaf in the wind, that he quivered with the consciousness and the knowledge before the question of whether he is worthy of this high rank, honor and responsibility. "And so this time, my thoughts are directed to God, our Savior, the Great Shepherd of the Church, who awarded me with goodness and His grace" said Patriarch Irinej of Serbia.